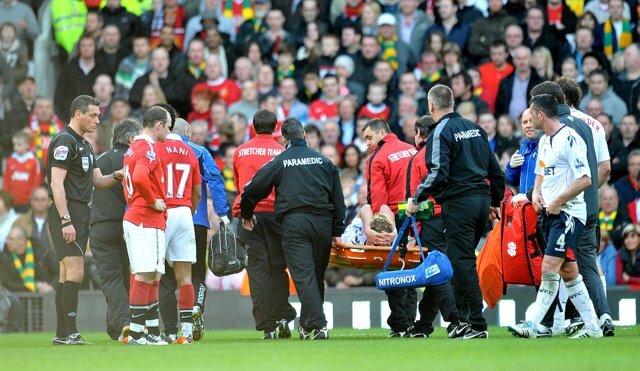 Poor old Stuart Holden leaves the Old Trafford pitch on a stretcher after having his knee spliced open by Jonny Evans’ lunging, front-on tackle. A total of 26 stitches were needed to close up Holden’s wound, but scans have revealed that the American thankfully didn’t suffer a break – though Bolton are still waiting to ascertain the full extent of the injury. Danny Higginbotham celebrates after scoring his second scorching free-kick in as many games. Stoke went on to batter Newcastle with four unanswered goals. Speaking of free-kicks, Charlie Adam’s whipped effort against Blackburn was a thing of sheer beauty. After falling two goals behind (Adam also scored a penalty), Rovers salvaged a point at the death thanks to a 93rd-minute equaliser from Junior Hoilett. Manuel Almunia – in goal – where he should probably stay next time. Fulham’s Clint Dempsey became the first American to score ten Premier League goals in a season (Brian McBride scored nine league goals for the Cottagers back in 2006/07) after notching a consolation strike against Everton. Everton won 2-1 thanks to Seamus Coleman’s far-post header and Louis Saha’s (hang on, I thought he was left-footed?) free-kick. Matt Jarvis’ sumptuous volley proved to be the difference between Wolves and hapless rivals Aston Villa. Jarvis has since received his first England call-up, so hearty congrats must go out to him. Maynor Figueroa is swamped by his Wigan teammates after scoring an injury-time winner against Birmingham, thus raking in three much-needed points for the Latics as the congestion at the bottom-end of the table (ten points separate 7th and 20th) continues to mount. Gareth Bale is forced to change his shorts during Tottenham’s goalless stalemate with West Ham. Ramires tucks away Chelsea’s second of the evening after weaving his way through the Man City defense. David Luiz notched the first, meaning that the centre-back that Chelsea bought on deadline day is currently comfortably outscoring the £50 million striker. Darren Bent’s beachball accomplice, Dirk Kuyt’s phantom free-kick, referee Kevin Friend’s decision to reverse his original (and correct) assumption that Liverpool’s Jay Spearing was felled by Sunderland’s John Mensah on the edge of-, not inside- the area, only to about-face and award a controversial penalty after his assistant piped up from the touchline – just another traditional, controversy-mired fixture between Liverpool and Sunderland then. Friend’s bungle handed Kuyt a chance to open the scoring from the spot which the Dutchman duly ceased, with a ridiculously acute finish from Luis Suarez sealing the deal for Kenny Dalglish – who was eventually able to celebrate the 250th win of his managerial career. @Herp: Yup, cheers for the spot, brain freeze again – Ryan Jarvis is actually just a friend of mine. That Suarez goal was BRILLIANT! And yeah those leg muscles on Bale look like some kind of aberration. Frightening.